As a Team Leader she is instrumental in overall design, client liaison and managing a diverse team of consultants spread all over the world. Shirrin incorporates elements of French classical design into her projects and brings about a very contemporary and modern look with the materials used, to bring about a lasting memory to the end user. She tries to push the design boundary to provide the user an experience they will yearn for again and again. • Hotel Vier Jahrszeiten Kempinski, Munich; Germany: Shirrin is the design lead on this multi-year and multi-phase complete renovation of Kempinski’s global flagship hotel. Scope of work includes a new design for over 300 guestrooms and suites; full redesign of all public lobbies and other areas and two of the four restaurants in the hotel. The project started in 2006 and is slated to complete in 2014. The project has won numerous awards including the Hospitality Design Award from the Bund Deutscher Architekten; and various other national and international awards in the hotel and preservation categories. • Hotel New York Palace, New York City; USA: Shirrin was the project designer on the major redesign of the New York Palace Hotel. This included complete design of the public areas and the private condo suites. The project started in 2003 and finished in 2006. The American Institute of Architects, New York Chapter, awarded a Medal of Honor to the project. • Peniche, White Plains; New York City: Shirrin was the design lead on this Michelin star restaurant serving nouveau French contemporary cuisine. The restaurant played up on the iconic French motifs to create a very calming and welcoming experience. The restaurant opened in 2007 amidst great reviews in the local and regional press. • Private Residence, Sunset Boulevard, Los Angeles CA: Complete design for a 11,000 sft. Villa with a design budget exceeding $ 6 million. • Private Residence, Central Park South, New York NY: Complete redesign for a 2400 sft. Penthouse with a design budget exceeding $ 2 million. • Private Residences, Verrier, Provence; France: Schematic design for a complex of private country homes in the French Riviera. In 2011 Shirrin started her own design studio under the name of MAZDA Designs. This new business allows Shirrin the flexibility to choose projects where she can push the design boundary out of the regular norm and allows her the choice to work with clients who like very unique one-off design solutions be it entire residences or custom furniture pieces. MAZDA Designs is currently working on projects in New York City, and New Jersey in the USA and in Mumbai India. Work includes custom furniture design for private residences in the USA and a historic preservation of a century old house in India. Alongside her professional design work and passion for photography, Shirrin is a semi-professional dancer, trained in various styles of Latin American, Afro-Cuban and Classical Ballet. She has trained with some of the leading salsa professionals in New York City like Sekou Miller and the Godsell Dance Collective, and is a regular performer on the city’s vibrant salsa circuit at prestigious venues such as Jimmy Aton and Club Cache. Shirrin’s major performances include primetime at the New York Salsa Congress in 2012 and 2013. Shirrin is the winner of the Young Zoroastrian Entrepreneur/ Professional Award 2014 by the World Zoroastrian Chamber of Commerce for her independent design consultancy MAZDA Designs based out of New York City. She was presented with the award by Lord Karan Bilimoria at the WZCC Global Annual General Meeting in Dubai on December 18, 2014. To Eternity and Back is a collection of enchanting visions of ephemeral and timeless moments that reflect the grand miracle of nature as well as intimate encounters with the everyday in New York City. Saturated hues bathe sunsets, oceanic views and buildings so that they merge into a Divine order, palpitating with the oneness of being. These ethereal visions of beauty are meditations on presence and they call forth the viewer to contemplate the fullness of our existence here and now. Shirrin’s love for photography began quite accidentally two years ago in Mumbai, when she was visiting from New York. 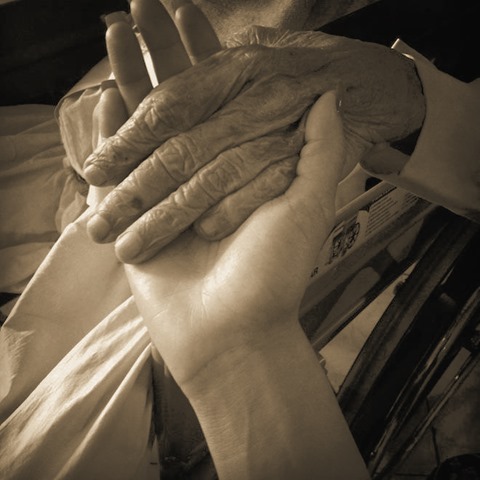 Her beloved maternal grandfather was ailing, and as she held his tender and frail hand in her youthful and manicured one, she was overcome with emotion. She reached for her iPhone at hand to frame and capture that transitory, yet eternal moment. Shirrin considers this image her first ‘real’ photograph, for she became deeply aware of the power of photography to tell a personal story. Upon her return to New York, Shirrin started to capture the wondrous, atmospheric moments in her environment. She began simply with her iPhone, taking photos of the cityscape she loves: of monumental facades, of dazzling reflections on the surfaces of towering concrete and glass buildings, of incredible cloud patterns in the sky at all times of the day, of famed bridges, monuments and landmark sites, and so on. As her interest in the medium deepened, she experimented with other cameras, editing tools and printing methods and used them all to great effect, enhancing each photograph to extract its optimal and spiritual essence. Whilst most of the photographs in this exhibition are an ode to that celebrated muse New York City, photographs like Roots (2012) and The Journey Begins (2013) are well-timed moments of pause, tracing the story back to Shirrin’s roots, to the place where it all began – in Mumbai. Roots is a sepia-toned photograph of the stone slab on which Shirrin’s grandfather was placed before making his final journey to the Tower of Silence, according to Parsi custom. The Journey Begins is the familiar stretch of The Queen’s Necklace at Marine Drive in a fiery display as the sun stages its disappearance from the horizon. It is pertinent then, that she elected to have her debut exhibition of photography in the city of her birth, and also the place she bade her grandfather farewell. Copyright © 2015 Shirin Kumaana-Wadia, All rights reserved.